Sports Illustrated is known for it’s all-inclusive sports content, reporting, news, longform story telling, scouting reports, and much more that is featured on the website and in the magazine. The evolution of how users consume sports content and how historic brands are delivering it now has changed dramatically. 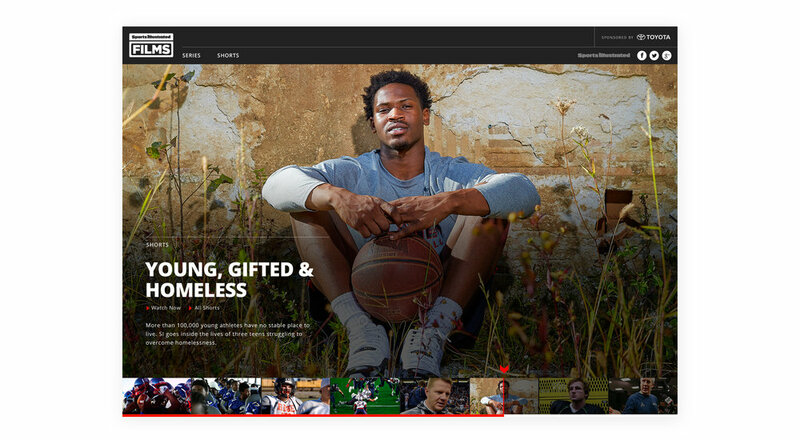 SI Films was designed as the vessel for all of Sports Illustrated’s award-winning mini documentaries and series. This web platform aligned with the changing consumption habits and embraced independent voice and quality of video. After collaborating with the digital, product, and video teams, presenting and recommending concepts and solutions to our challenges, to then visualizing a premium look-and-feel that fit within the overarching brand, we forged ahead with this final solution. This made it’s MVP debut in Fall 2015 where it hosted many custom videos and clearly solved a huge challenge in the original video space within Sports Illustrated. This website eventually got overturned by SI.TV, which is the current platform today.